What are the fees, costs and outlays involved in making a personal injury* claim? The costs and outlays involved in taking a personal injury case will vary due to numerous factors which can arise in each case. Mulroy and Company Personal Injury Solicitors will carefully examine the facts of your claim and discuss with you the likelihood of a successful outcome before beginning your application to the Injuries Board also known as the Personal Injuries Assessment Board. Once we assess your claim Mulroy and Company Personal Injury Solicitors will provide you with an estimate of the fees, costs and outlays involved in taking your personal injury claim. Frequently in personal injury cases solicitors will agree to act on a ‘no foal no fees basis’, meaning if your claim is unsuccessful, you will not pay the costs of taking the claim. If you want to to understand what is meant by the term ‘no foal, no fee/no win, no fee’ you can read here. Mulroy and Company Solicitors will give you information about legal charges – the money you must pay them for their services. The law that deals with legal charges is Section 68, Solicitors (Amendment) Act 1994.
the basis on which the solicitor’s charges are to be made. For more information about how charges for legal services are incurred, see the Law Society’s Legal Charges Guide . Solicitor charges to their client will apply when the costs for carrying out the work of the personal injury case cannot be recovered from the Defendants when the action settles or when the court case is won. Such solicitor costs would be for initiating the application to the Injuries Board and the work that is performed in connection with making that application. There will also be a number of fees associated with taking court proceedings. Such fees will included the preparation of court documents, consultations with Counsel and all other fees associated with proceedings. Taking a claim for personal injury will usually involve making an application to the Injuries Board. Their fee for the assessment is €45.00. When submitting your application to the Injuries Board you will also have to submit various medical reports which average from €250 – €300 each. On average, if your claim to the Injuries Board settles after they have made their assessment, any costs associated with that claim will normally be paid out of any compensation they award you. However, it can also be the case that the Insurers for the Defendant may want to settle your claim against them after the lodgement of your application to the Injuries Board. If the Injuries Board have not yet made an assessment, generally settlement negotiations will be arranged and your solicitor will insist that your costs associated with the claim be paid by the Defendant. If they do not accept to paying your costs, then in most circumstances your solicitor would recommend that you wait for the assessment of the Injuries Board. It should be noted that it is normal for a case to be settled before the assessment of the Injuries Board is made. To find out more on what compensation you may be get see here. If your case is not settled before or after the assessment of the Injuries Board, it may be necessary for you take legal proceedings before the District Court, Circuit Court or the High Court. It is common practice that your costs for taking these proceedings will be paid by the Defendant if you are successful in your action and if a settlement is agreed. Party costs refers to the fees incurred by your solicitor when dealing with the other party in connection with your court proceedings, if your claim reaches this step. These costs generally include all correspondence/meetings with the Defendants, filing motions, attendance at court and all work dealing with your court proceedings. If you are successful in your claim, it is usual that your solicitor will make sure the other side will discharge any party costs owing in connection with your court proceedings. It can happen that it is not possible for your solicitor to recover the full amount of party costs. If there is a shortfall, your solicitor will have already discussed with you the entitlements and offers of what can to be done in this circumstance. 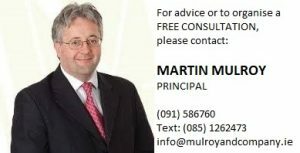 Mulroy and Company Personal Injuries Solicitors Galway are here to help. Please do not hesitate to telephone us at 091 – 586760 or email us to discuss your claim.